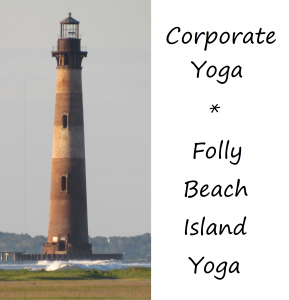 We offer retreat style beach yoga as well as in-office yoga classes for businesses and wellness centers in the Charleston, SC area. All of our classes are taught by a 200 or 500 hour certified yoga teacher. Regular yoga in the workplace can improve employee morale, attendance, and overall well-being while bringing clarity, inspiration, innovation, and team building skills into the work space or office culture. For businesses in and around the Charleston, SC area we offer daily, weekly, bi-weekly, and monthly in-office yoga classes. We can also arrange regular seaside yoga sessions for our corporate clients. Our classes feature breath control, mindfulness, and deep relaxation. The class pace is adjustable and can meet all experience levels, as well as grow and adapt with your group. For those visiting the area for business we can offer a single beach yoga class, half day, full day, weekend, or full week packages on Folly Beach Island. Looking for the perfect workplace incentive or holiday gift for your employees? We offer gift certificates and can even provide corporate passes for our open level beach yoga classes to provide your employees with added flexibility in their schedules. We even offer kids yoga in some local corporate child care centers! Let us help you design a special employee perk for your Charleston, South Carolina area business’s wellness package! Contact us to schedule a corporate yoga consultation. All classes and offerings are subject to schedule availability.